Since 2010, Champlain College has been quietly mounting three exhibits a year in Perry Hall that highlight its fascinating Llewellyn Collection. 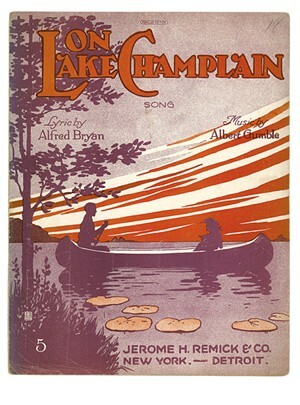 Donated by Burlington resident and Vermontiana enthusiast Lance Llewellyn, the assortment of vintage Vermont postcards, maps and memorabilia includes 80 scores of sheet music — songs by Vermont composers published between the 1850s and the first decades of the 20th century. An exhibit last September featuring select scores caught the eye of University of Vermont music-history professor Wayne Schneider. A specialist in George Gershwin with an interest in popular music, Schneider subsequently pored over the compositions — his wife, Paula Olsen, is a reference librarian at Champlain — and selected 15 pieces to resurrect in a concert. Next Thursday, May 22, Schneider will accompany the soprano/tenor couple Mindy and Bill Bickford of Charlotte on a piano that's being carted into Perry Hall's 55-seat Presentation Room for the occasion. During a recent tour of the building's lounge and two conference rooms where the collection's changing exhibits are laid out, Erica Donnis, who began managing the Llewellyn Collection a year ago, points out a row of framed sheet-music covers on one wall. "There was a whole industry in Vermont of composers and publishers, and a trend of [producing] music for amateur musicians to play in the home," she explains. Most of the songs cash in on "nostalgia for old Vermont," Donnis continues; "the market was partly people who had moved away." Such people were apparently already longing for a lost Vermont in 1903, when a Philadelphia press published Alice Cloe Smalley's song "Where the Apple Blossoms Blow in Old Vermont." 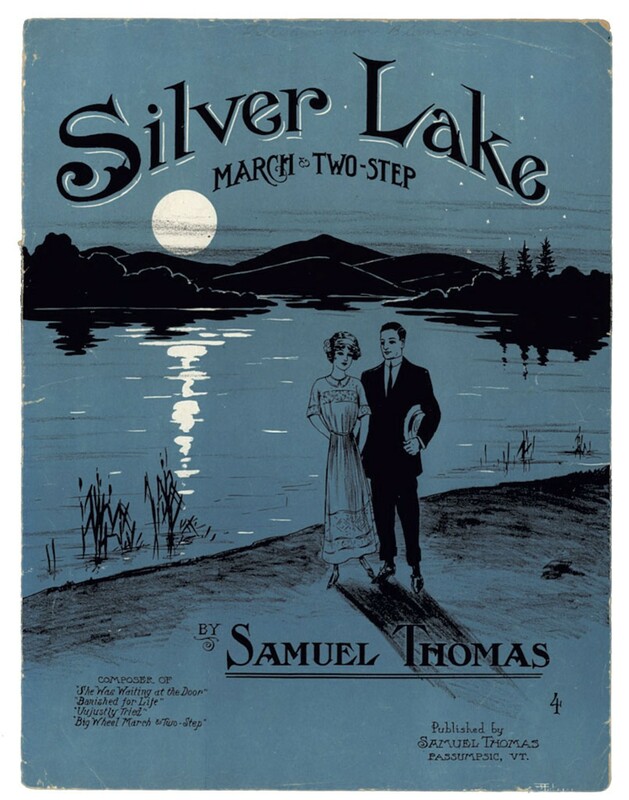 Another framed cover aims for modern romance: "Silver Lake: March and Two-Step" by Samuel Thomas, published in Passumpsic in 1911, depicts a Victorian-dressed couple strolling by a lake in the moonlight in art-deco colors. Donnis chose both for the rooms' current exhibit, "Marketing Vermont," which will be open to the public before and after the concert. For the performance, Schneider has chosen songs representing nearly a century of the trend. 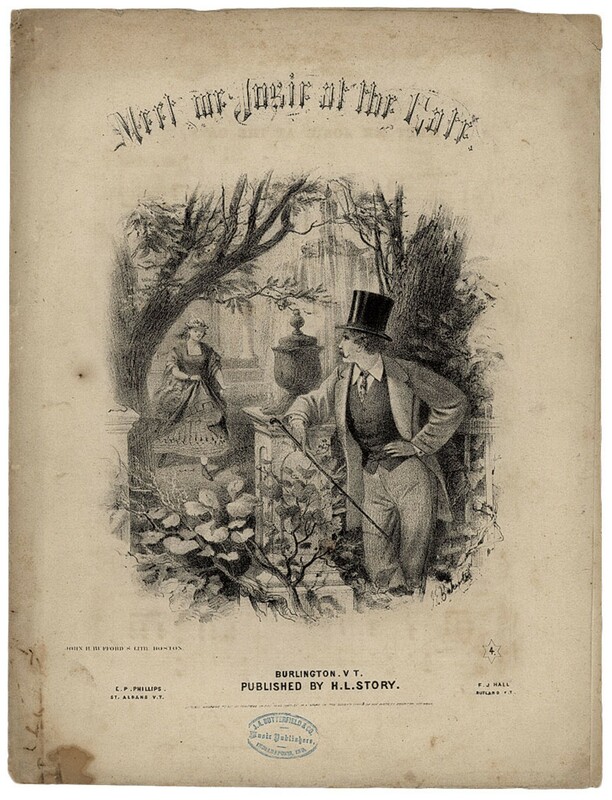 These include an 1867 love song called "Meet Me Josie at the Gate"; the Bennington Battle Monument dedication song from 1891; the 1909 song celebrating the tercentenary of Lake Champlain's "discovery"; and novelty songs. The last category includes two 1950s songs: one called "Uh Huh (Meaning Yes)" and an ice-cream-parlor tune that sounds "a little rock and roll," Schneider promises. The professor is also the organist and music director at the First Unitarian Universalist Society church in Burlington, and the former director of a church choir in Essex, where he met the Bickfords. The couple regularly performs musical theater; Schneider calls them "great entertainers." Until Schneider asked them to perform the vintage Vermont songs, recalls Bill Bickford, the couple had never heard of the Llewellyn Collection. When they hopped online to view it, they discovered a surprise. "Lo and behold, two of the songs were written by Mindy's great-grandfather, Frank J. Preston, who started Preston's Jewelers on Church Street," Bickford says. He's an IBM engineer; Mindy runs an equestrian center. The couple had sung Preston's songs many times around the piano at family gatherings but had no idea they'd been collected and catalogued. The two Preston songs create "a nice mini-group within our program," Bickford adds. "This guy loved chromatic chord progressions and fitting the voice and piano into these intricate patterns. It's almost like he was doing musical sudoku." Schneider, who previously researched Rhode Island's sheet music for a concert there, notes, "Probably every state has a certain repertoire that celebrates it." The value of such music is that it created a shared experience. "This music is not high art," Schneider notes. "It was popular — not only quantitatively, in that it was widely disseminated, but it struck a responsive chord in the hearts of Americans." The concert, which will end with "Moonlight in Vermont" from 1944, will likely move a few present-day hearts, too. 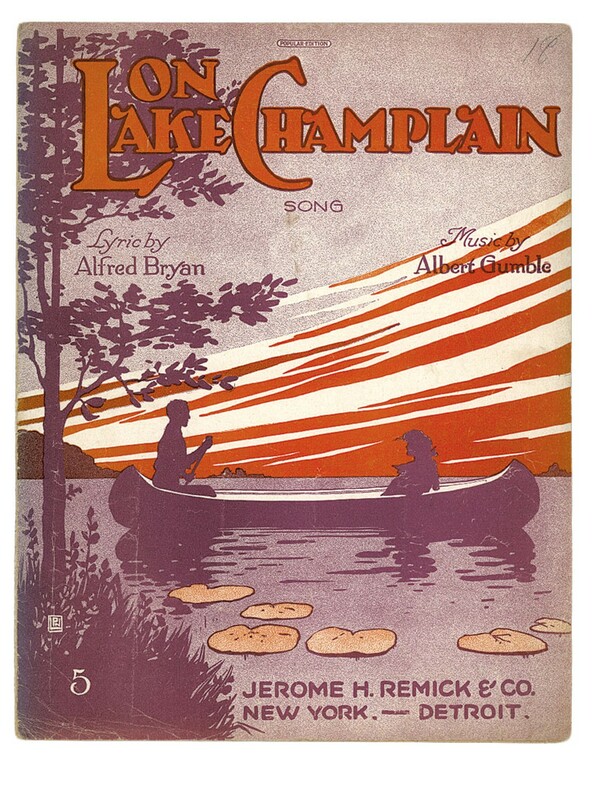 Songs of Vermont: Celebrating Sheet Music in the Llewellyn Collection," Thursday, May 22, 7 p.m. at the Presentation Room at Perry Hall, Champlain College, in Burlington. Limited seating; reservations requested by May 15 at mboyers@champlain.edu or 651-5837.